Acclaimed by Opera News as a “standout...with a breathtakingly lush voice,” American bass, Brent Michael Smith, is from the historical town of Owosso, Michigan. Brent makes his debut with Opera Philadelphia as Peter Quince in A Midsummer Night’s Dream in February of 2019. 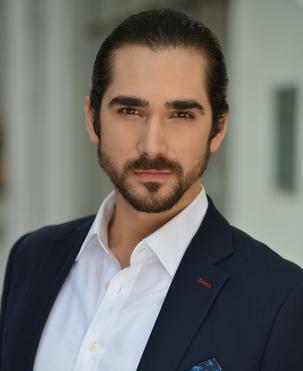 Brent made his mainstage debut with the Santa Fe Opera in the summer of 2018, singing the Lakai in Ariadne auf Naxos. In Fall of 2017, Brent joined the roster of resident artists at the esteemed Academy of Vocal Arts in Philadelphia. There he studies with Bill Schuman. This season he sang Fafner in Das Rheingold, Truffaldino in Ariadne auf Naxos and the Marquis in La traviata. He also made his debut with Arizona Opera singing The God of Evil and Procrustes in their production of Hercules vs. Vampires, a new score by Patrick Morganelli synchronized to the 1961 cult classic film Hercules in the Haunted World. In 2017, Brent made his mainstage debuts with The Glimmerglass Festival as well as the Toledo Opera. At Glimmerglass, critics praised his portrayal of Ariodate in Xerxes. He also starred as The Commentator in Derrick Wang’s Scalia/Ginsburg. At Toledo Brent sang Antonio in Le nozze di Figaro. Brent recently finished his time as a Resident Artist at Michigan Opera Theatre (MOT). During the 2016-17’ season, his roles included: Zuniga in Carmen, the British Major in the Pulitzer Prize winning opera, Silent Night, by Kevin Puts, Friedrich Bhaer in Little Women, Ashby in La fanciulla del West and Marquis de Brisaille in David DiChiera’sCyrano. During the 2015-16,’ Brent debuted as Colline in La bohème. Other notable roles were the Second SS Officer in The Passenger, Grandpa Moss in The Tender Land, The Doctor in Macbeth and the Speaker in The Magic Flute. In 2015, Brent sang Harry Hopkins in the world premiere of Daron Hagen’s A Woman in Morocco, as a part of Kentucky Opera’s American Opera Initiative. Brent has been a young artist with companies such as the Sarasota Opera, Central City Opera and Des Moines Metro Opera--where Colorado Music Buzz praised him for“making the most of his brief appearances” as Billy Jackrabbit in La fanciulla del West. Brent received his master of music degree from the University of Northern Iowa (UNI),singing under the tutelage of John Hines. He received his bachelor’s degree in musicfrom Hope College (Holland, MI), majoring in piano performance and minoring in Spanish. He studied voice with Linda Dykstra. Brent is a first-place winner of the Grand Rapids Opera Competition (2012), a prize winner in the Mid-Atlantic Regional Finals of the Metropolitan Opera National Council Auditions (2018), and a winner in the Opera Birmingham Competition (2018).